Divorce can be emotionally and financially devastating for the parties involved. Litigation often takes multiple months, even years. Winner-take-all attitudes predominate in family court, yet there is usually no real “winner”. After nearly 20 years of family law litigation, I decided to shift my focus to guiding clients through the challenges of divorce while attempting to minimize conflict. Efficient resolution of the issues means less cost, so clients can move on to their Next Chapter. A San Diego native, Amy completed her B.A. degree at the University of California, San Diego and graduated with a J.D. degree from Pepperdine School of Law. 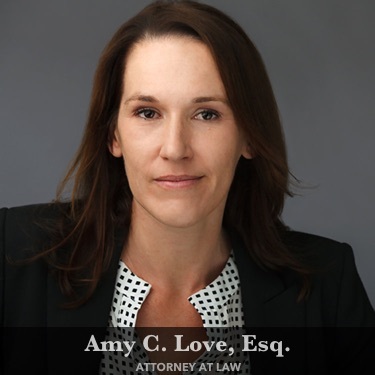 Admitted to the California Bar in 1999, Amy has focused exclusively on family law and estate administration. Set up a free, 30 minute consultation to provide you with information about the process, answer any questions you may have, and to give you an opportunity to see if Amy is a good match for you. Consultation can be by telephone or in person in the central San Diego area. This website, www.loveapc.com (hereinafter referred to as “the Website”), is “advertising” as defined by § 6157(c) of the California Business and Professions Code and a “communication” as defined by Rule 1-400(A) of the California Rules of Professional Conduct. Amy Christina Love (hereinafter referred to as “the Attorney”) is licensed to practice law in the State of California only and maintains an office in the County of San Diego in the State of California. The Attorney practices solely in the State of California and primarily in the county of San Diego. The Website is published and maintained for general educational purposes only and is not intended to provide legal advice on any subject matter whatsoever. The Website and its contents are provided “AS IS” and without warranty of any kind, either expressed or implied. Your use of the Website is at your own risk. Due to frequent changes in the law, some of the information on the Website may not reflect the current state of the law. Neither the Attorney nor Love & Love, APLC (hereinafter referred to as “the Firm”) is responsible for any errors or omissions in the content of the Website or for damages that arise from your use of the Website under any circumstances. No viewer of the Website, client or otherwise, should act or refrain from acting on the basis of any content included in the Website without seeking appropriate legal advice (in consideration of the particular facts and circumstances at issue) from an attorney who is licensed to practice law in the viewer’s state. Your use of the Website does not establish an attorney-client relationship between you and the Attorney or between you and the Firm. Contacting the Attorney or the Firm through the Website does not create an attorney-client relationship between you and the Attorney or between you and the Firm. No attorney-client relationship will be formed without a written engagement agreement that is signed by the Attorney and a client and that defines the scope of the representation of the client by the Attorney. Nothing on the Website is intended to guaranty, warranty, or predict the outcome of a particular case and should not be construed as such a guaranty, warranty, or prediction. Any information sent to the Firm by internet, email, or through the Website is not secure and is sent on a non-confidential basis. Divorce, custody, and estate planning law is state-specific. Information contained on the Website may not apply in your state. Any and all information published on the Website is specific to the State of California, unless otherwise specified. The Attorney does not seek to represent anyone based solely on a visit to the Website and does not wish to represent anyone seeking representation based on viewing the Website outside of the State of California. Likewise, the Attorney does not wish to represent anyone desiring representation based upon viewing the Website in a state where the Website fails to comply with all laws and ethical rules of that state. The Website is not intended to be an advertisement for legal services to be performed outside of the State of California. Links to third-party websites published on the Website are provided for your convenience only and do not necessarily imply the Attorney’s or the Firm’s endorsement, recommendation, or approval of the third-party websites, their content, or the services/products provided by their operators or the persons who maintain them, nor do such links imply an association between the third-party websites (and/or their operators) and the Attorney or the Firm. Neither the Attorney nor the Firm is responsible for the content and accuracy of information contained on third-party websites. Any inclusion on the Website of material from identified sources is for educational purposes only and is not intended to infringe on the copyrights of the identified sources. Articles and posts maintained on the Website may be updated after publication. Unauthorized use or reproduction of any information contained on the Website is prohibited and may violate applicable laws.